Polly Friendshuh knows what it’s like to take the path less traveled. And she has often been the one leading the journey. While growing up in Bloomington, Friendshuh had always planned to be an engineer. Her aptitude for math and science combined with the encouragement of her father made the decision an easy one. She enrolled at the University of Minnesota-Duluth right after high school. But life took a different turn when she got pregnant, married, and decided to leave school. A few years later, Friendshuh found herself a divorced mom raising two young children with no way to support her family. It was position she was determined to never be in again. With that in mind, Friendshuh enrolled at the University of Minnesota as an electrical engineering major. The next year and a half was a struggle, and the combination of schooling and small children led Friendshuh to seek a change. She took the summer off and decided to find a quicker path to a good paying career. Polly Friendshuh explaining a lab during a break out session. 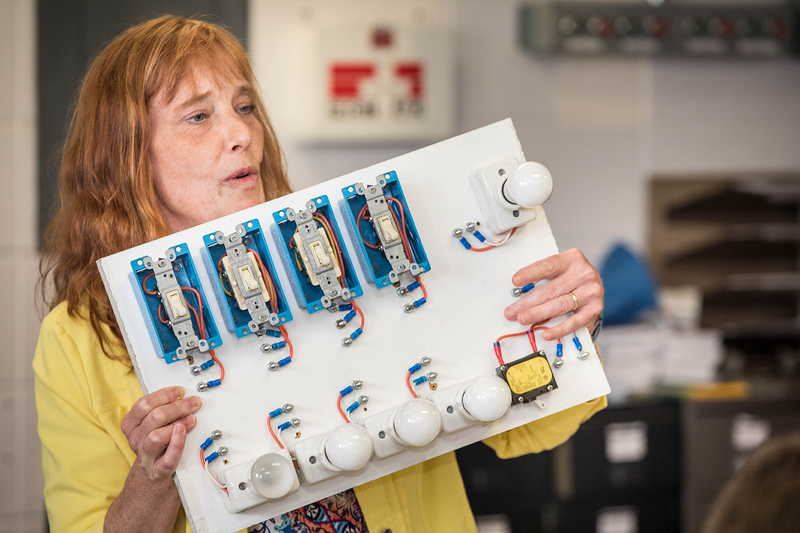 When Friendshuh decided to pursue an electrical construction degree, she first looked at Dunwoody, but the program had a three-year wait list at the time. It was time she didn’t have. So Friendshuh enrolled at Minneapolis Community Technical College for electrical construction. After spending a year in the program, Friendshuh applied to the Union and was accepted, becoming the 11th woman in an industry with 2,500 members. In fact, it wasn’t until five years into her career that she encountered another woman working on the same job site. “I have some horror stories, and I have some fabulous stories,” Friendshuh said about her early-career experiences. But she eventually discovered that there is a place for everyone in the field. Friendshuh recalls one electrician who provided the support she needed when first starting out. Friendshuh eventually became a licensed journeyworker electrician, mainly in the commercial industrial arena, before working her way up to project management. Over the years, Friendshuh’s career path has opened doors and provided opportunities to work on a vast number of interesting projects, including the Twin Cities’ light rail system. After the light rail project Friendshuh took a position in construction services for the University of Minnesota. By this time, Friendshuh had remarried and was working as a foreman for the University when her husband saw the job opening for an electrical instructor at Dunwoody and encouraged her to apply. Now an Electrical Construction & Maintenance Assistant Professor, Friendshuh said teaching wasn’t something she had ever imagined doing, but it is something she has come to love. And for Friendshuh her connection with her students doesn’t end at graduation. Friendshuh has also maintained her love of learning, earning a Bachelor of Science Degree in Career and Technical Education from the University of Minnesota, an MBA from Concordia University and a Master Electrician license from the State of Minnesota. She also keeps up-to-date on all of the current electrical codes, which change every three years. And while women have made great strides in the industry since Friendshuh joined more than 30 years ago, she acknowledges that there is still room for improvement. When she looks to the future, Friendshuh is excited for the industry, including the opportunities in solar and renewable energies.